MANILA -- The Department of Education (DepEd) on Wednesday assured the public of its commitment to continue with the Senior High School Voucher Program (SHS VP) for school year (SY) 2019-2020 amid challenges in its implementation. In a statement, the DepEd said its engagement of the services of private educational institutions and non-DepEd public schools offering SHS through the voucher program under the Expanded Government Assistance to Students and Teachers in Private Education will continue in compliance with section 10 of Republic Act 10533. The law is otherwise known as "An Act Enhancing the Philippine Basic Education System by Strengthening its Curriculum and Increasing the Number of Years for Basic Education, Appropriating Funds Therefore and for Other Purposes." "It is the mandate of the Department to uphold the right of every Filipino to quality basic education by providing access, whether through public programs or through arrangements based on the principles of public-private partnership," the statement read. However, the application for the SHS VP for SY 2019-2020 is yet to be opened pending the issuance of the fiscal year (FY) 2019 GAA. "Pending the issuance of the 2019 General Appropriations Act (GAA), the national budget for FY 2018 is deemed reenacted. The reenacted budget shall remain in force until such time that the GAA is passed into law by Congress. Subsequently, the Department of Budget and Management (DBM) has released Circular Letter No. 2019-01 or Release of Funds for the First Quarter of FY 2019 stating that in the absence of the 2019 GAA, the budgetary support to cover the operations of all national agencies is equivalent to the appropriations based on the FY 2018 GAA or on the FY 2019 National Expenditure Program (NEP), whichever is lower," the statement read. The DepEd said the total appropriation for the SHS VP in private and non-DepEd schools is PHP14.4 billion under the FY 2018 GAA, while the 2019 NEP is PHP20.3 billion. As a result, the program is short of funds amounting to PHP5.9 billion. The DepEd also clarified that Grade 10 completers in SY 2018-2019 are automatically eligible and need to apply for the vouchers. Also included are all Grade 10 completers in public schools operated by DepEd; all Grade 10 completers in state and local universities and colleges; and all Grade 10 completers in private schools that are Educational Service Contracting grantees. 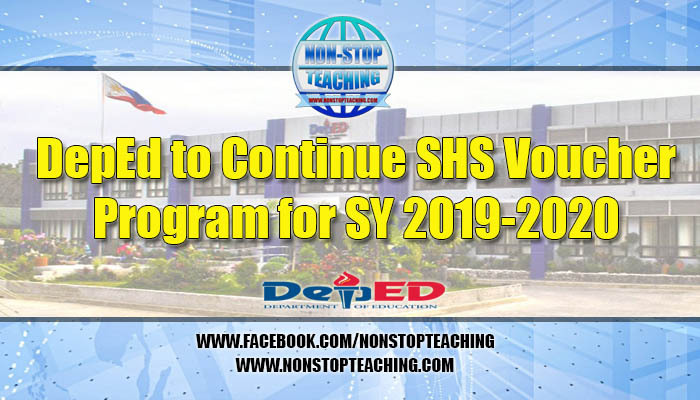 The Department of Education (DepEd) on Wednesday assured the public of its commitment to continue with the Senior High School Voucher Program (SHS VP) for school year (SY) 2019-2020 amid challenges in its implementation.